Text is taken from a poem honoring Heidelberg, written in 1853 by Josef Viktor von Scheffel and set to music in 1872 by Weise von Zimmerman. Central image depicts Heidelberg castle. 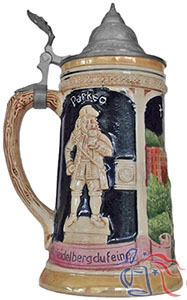 Side images include the castle’s 58,100-gallon royal wine keg, purportedly the largest wooden barrel in the world, as well as Perkeo, an 18th-century dwarf who served as both court jester and keeper of the royal keg. Despite his size, he was reportedly quite a prodigious drinker and, according to legend, his death came about when he mistakenly drank a glass of water.